The Chamber is holding its 131st Annual General Meeting in the Sir John A. ballroom of the Delta Prince Edward Hotel at 9:30 AM on May 14, prior to the President's Annual Luncheon. 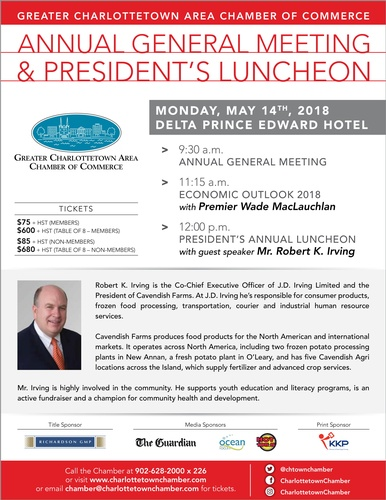 Tickets for the President's Annual Luncheon are available by calling the Chamber office at 902-628-2000 or by e-mail at chamber@charlottetownchamber.com. For refunds all cancelations must be received in writing no later than 5 working days before a scheduled event. No refunds will be issued for cancelations received after the deadline. Refunds will not be available for registrants who choose not to attend an event. The Greater Charlottetown Area Chamber of Commerce reserves the right to amend or cancel any event and is not liable for any expense incurred by participants as a result of cancelation.